MANILA, Philippines - Her fans, the Philippines rather, are about to finally meet their queen. That's right folks, after the mayhems beginning with the announcement of Steve Harvey during the pageant night, uncalled statements of her fellow beauty queens, and condemnation of her fans over the rusty pots at her New York apartment, Miss Universe 2015 Pia Wurtzbach will be finally home tomorrow, January 23. Miss Universe 2015 Pia Wurtzbach’s schedule of activities for her homecoming. 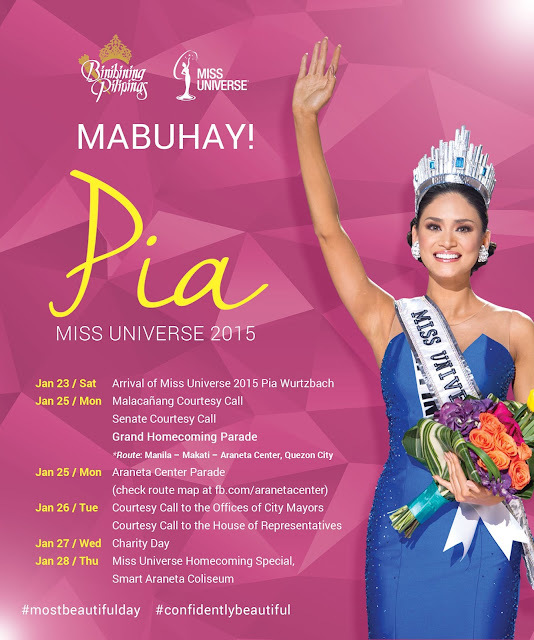 Wurtzbach will have her homecoming celebration happening on the last week of this month. The reigning Miss Universe will arrive in Manila tomorrow. After a day of rest, Wurtzbach will embark on a tight four-day schedule beginning on Monday (January 25) in which she will pay a courtesy call to President Aquino in Malacañan and in the Senate then heading later in the afternoon for the Grand Homecoming Parade traversing the three cities of Manila, Makati and Quezon City. The activity for that day will end as Wurtzbach will grace the Araneta Center Parade. Motorists and commuters are advised to take alternative routes to avoid any inconvenience on their journey in which the parade will take place. On Tuesday (January 26), Wurtzbach will visit the Offices of the City Mayors as well as the House of the Representatives as a courtesy call to them. The Wednesday (January 27) was alloted as a Charity Day for the Miss Universe to payback the Filipino community with their support on her. On the last day of her visit (January 28), supporters of Wurtzbach will be treated to another chance to savor the Miss Universe crown with her at the Smart Araneta Coliseum in which the Miss Universe Homecoming Special will be held.